Our latest feature in Sherborne Times can be found on pages pages 68-69 of the August issue. Blessed with such a glorious summer this year, harvest has come early. The drivers of the tractors and combine are all working hard in the fields surrounding the village. Whilst in the garden, the plum and damson trees that survived the harsh frost in April have now rewarded us with a bounty of fruit to gather. It is a busy time in the kitchen, preserving as much as we can now, so that it can be enjoyed in the months ahead. Definitely one of our favourite fruit. We have planted several young whips in the orchard since we moved to the farmhouse and we are fortunate that there is a mature tree within easy view of the kitchen window. Every year I delight in watching it burst into flower each spring. Now I shall soon be climbing the wall beside it so that I reach to gather every last one. We love to make damson cheese and have shared the recipe with you this month. This is equally as delicious with plums, if more easily available to you. 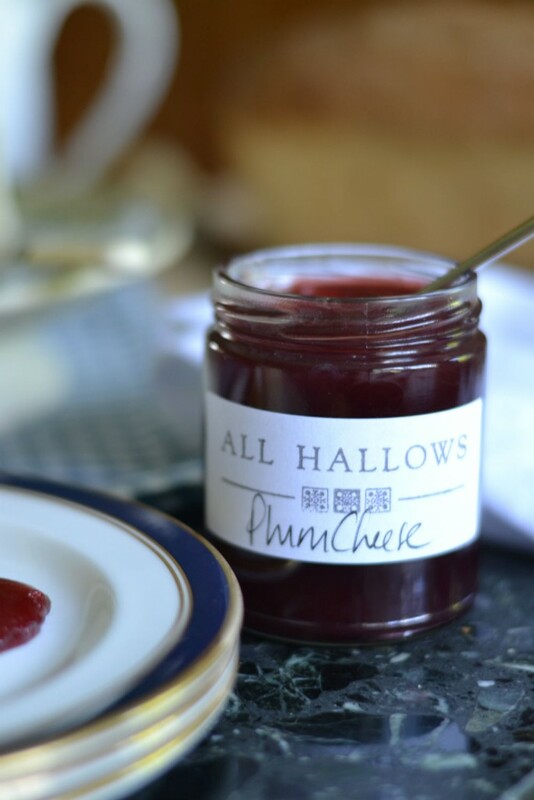 Alternatively if you have a good supply, try making a damson puree and combining with rich custard. Freeze for a seasonal ice-cream or instead add the sieved fruit to a gin infused syrup and transform into a decadent dinner party sorbet. Spherical moss-green plums that make fabulous jam. Admittedly a labour of love to remove the stones but a little time spent quietly in the kitchen will reward you with some store cupboard treats that will make a great gift too. This really is the season of plenty. When you are planning your garden for next year try to include a few raspberry canes as they will reward you handsomely. They make an ideal conserve for filling cakes and serving with cream team. If you cannot bear the fuss of removing stones from the larger fruit, there really is no excuse not to pick a few berries and make jam. If you have no aversion to the pips (and I always think it is rather a waste to sieve the puree before adding the sugar) then it is possible to pick your own from the garden and for it to be in the pot within 30 minutes. A neat row of scarlet filled jars labeled and looking tempting on the kitchen table, will no doubt make you feel smug and deservedly so! Seek out culinary plums for this recipe. 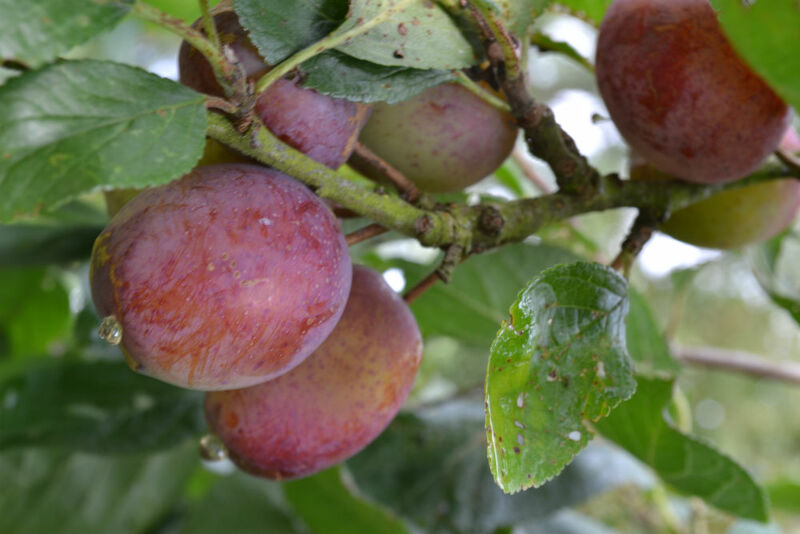 Gorgeous, richly flavoured fruit with names such as Marjorie’s Seedling, Laxton’s Cropper and Monarch Plum are best. Or forage for wild damsons, known as bullace in the Dorset hedgerows. Before you dismiss the labour intensive method this month, I guarantee an hour put aside in the kitchen will be rewarded. The end result will be two or three jars of a luxurious accompaniment for cheese and charcuterie that is worth the effort. Wash the fruit and cut plums in half but do not remove stones, whilst damsons can be left whole. Put in a pan with a tight fitting lid, add water. Place on boiling plate of your AGA and watch carefully as the temperature increases rapidly, then when fruit is starting to cook and soften, replace lid and transfer pan into simmering oven for 20-30 minutes, checking halfway. If using a conventional hob, start cooking over gentle heat and continue slowly with lid on. Take care as recipe only requires a small amount of water and check that pan does not catch. If necessary add a little more water but keep fruit pulp as dry as possible. Pass fruit through a nylon sieve, this will take time but is well worth the effort! Discard stones and skin. Measure pulp and allow 25g (1oz) butter and 450g (1lb) sugar to every 600ml (1 pint) of fruit. Put fruit pulp in a clean pan and place on simmering plate or over a low heat on conventional hob. Stir well and then add sugar and butter. Continue stirring until these ingredients have dissolved. Then increase heat or transfer to AGA boiling plate and boil steady until setting point (104 C – 105 C with a jam thermometer) has been reached. Spoon into sterilised preserve jars and seal immediately. Flake test – use a clean wooden spoon to stir the jelly until well coated, hold the spoon above the jelly and watch to see if a flake appears. This should not drop off the spoon until you shake it. Saucer test – drop a teaspoon of jelly onto the cold saucer and once it cools check to see if wrinkles form once it is pushed with your finger. Recycle your jam jars but buy new lids which are easily available online or cook shops. Fill the jars with hot jelly and either seal straight away.